20 essential Paul McCartney tracks that prove he's the best of The Beatles . Beatles Radio: The Beatles, Solos, Covers, Birthdays, News The Fab 4 and More! The Beatles' Paul McCartney and Ringo Starr chat about their documentary 'The Beatles: Eight Days a Week -The Touring Years' and the legacy of their band. It’s not particularly cool to claim Paul McCartney as your favorite member of The Beatles. 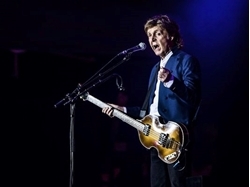 On one hand, the facts are on your side: Sir Paul is an institution in a way the other Beatles aren’t, perhaps the most beloved melody man in rock 'n' roll history, the defining force behind the genre’s defining band. And yet, legacy aside, claiming Paul as your favorite is corny, in the same way as claiming The Beatles are your favorite band is too obvious.